This entailed a long 3 day journey. “Why?” you may ask. Well, by day 2 I was asking myself the same thing. But then I thought, while travelling across the prairie, there must be a reason why so many people have done this same journey for the last 75 years. There must be some lesson(s) to be learned. And there were lessons learned. 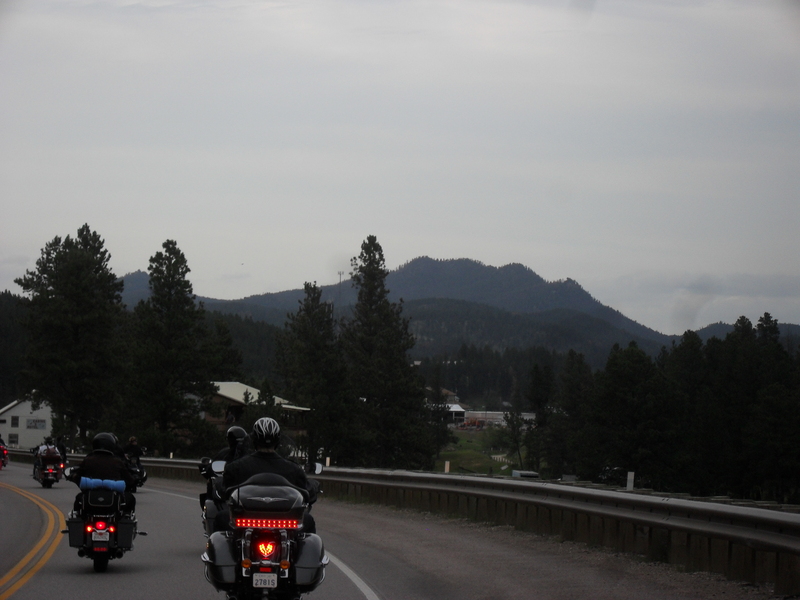 Below are five things I learned from travelling to Sturgis (and back home again). Always prepare for the unexpected. Driving along the interstate at 75 to 80 miles an hour provides a close-up view on how quickly weather conditions can change. Best advice ever: dress in layers and keep sunscreen and rain gear on hand. As well, never forget that clouds and an overcast sky are not forever. Keep steadily moving forward and you will see the sun break through before you know it. 2. Some days are awesome riding days. Some days are not. And this is okay. When you encounter bumpy roads and other unpleasant conditions, remind yourself that “it is what it is”. It’s just not a good riding day. That’s all. Tomorrow, most likely, will be better. 3. We all get by with a little help from our friends – even when they start to irk us. There is no doubt, travelling down the road as a pack in staggered formation, is way safer than travelling alone. Cars see and respect your space much more than when you are alone. As well, the extra eyes can spot possible dangers on the road much more efficiently. Of course, there will always be that friend (or friends) who begin to annoy you. Perhaps one friend starts cutting in further up the line, so everyone needs to regroup. Perhaps another friend is slightly out of pace with the others, leaving too much or too little space between bikes. Set boundaries, keep open communication, and above all, maintain a sense of humour. In the final analysis, each one needs the others. So concentrate more on being kind than on who is in the right or wrong. When double riding, the passenger on the back must have complete faith in the driver. When the driver leans in to execute a turn or bend in the road, the passenger must lean in as well. If the passenger panics and leans the other way, the bike could easily be dropped. Bottom line is, partners must have faith in each other and move together in order to make the relationship work. 5. In the end, no matter how many come along side you, your journey is your own. It is individual to you. Be sure to embrace and love it. The people you are journeying with will all have their own bikes and gear. Each will have their own individual style. Do not waste time comparing yourself to the others. They are on their own journey, and you are on yours. Enjoy the ride. Love where you sit in the pack. Have fun. Smile and laugh. This moment is for now to enjoy, and will be gone tomorrow. As I mentioned before, it took three days to travel those kilometres/miles to Sturgis. When we arrived, we were treated to a wonderful time; great sights, scenic roads and amazing friendly people. 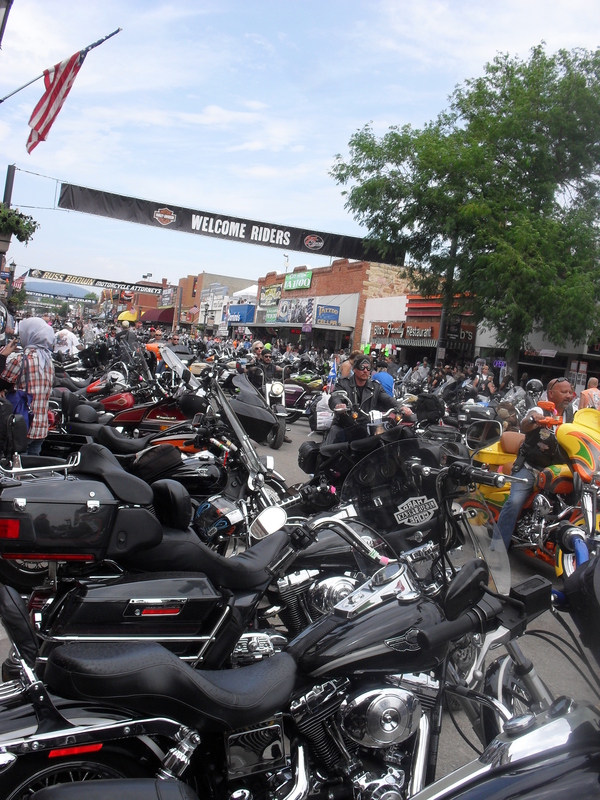 There is only one first time in Sturgis – and we enjoyed every minute of it!